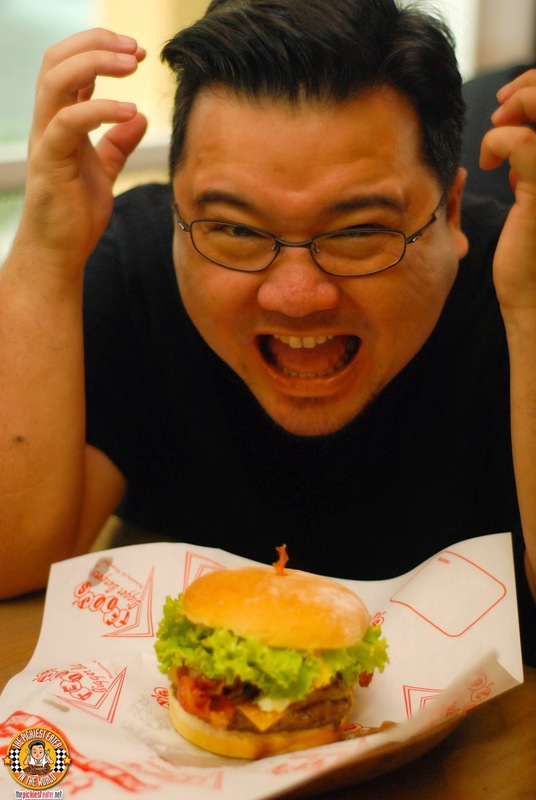 THE PICKIEST EATER IN THE WORLD: TEDDY'S BURGERS IS BAE-CON ME CRAZY! The first Burger that we tried was a stroke of pure genius. Everyone loves a good Grilled Cheese sandwich, right? 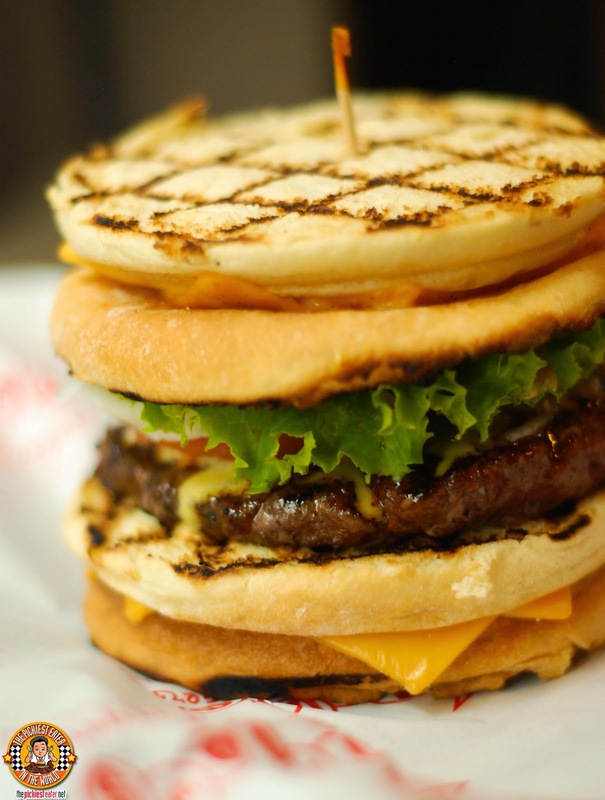 Well imagine a burger.. in which the buns are.. wait for it... GRILLED CHEESE SANDWICHES! Yes, you heard me right.. the "Buns".. are two slices of grilled bread with melted cheese squished in between it. So in effect, it's a Teddy's Burger Patty with all the classic fixins of Tomatoes, pickles and Onions, drizzled with cheese sauce, then sandwiched between TWO GRILLED CHEESE Sandwiches. It's incredibly delicious, but in case you haven't figured it out yet, it's REALLY heavy on the tummy, so I would recommend splitting this with someone, regardless of the size of patty you decide to get. I think I speak for the majority here when I say that all good burgers should have Bacon in it. 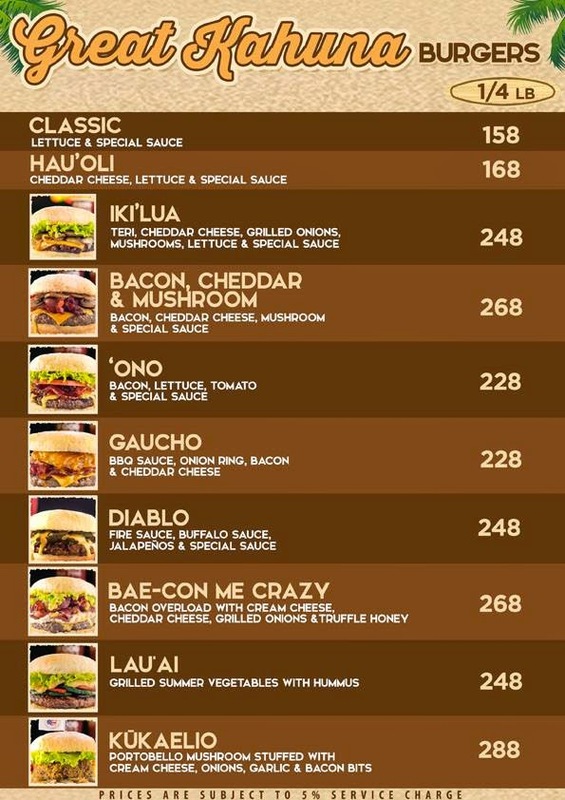 Even without fully reading the details, I ordered the Bae-con Me Crazy Burger (P268). The burger consisted of the 1/4 lb Patty that Teddy's is known for, and generously topped with Bacon, a blend of Cheddar and Cream Cheese. Afterwards, a handful of Grilled onions are added, then finished off with a drizzling of Truffle Honey. Oh and by the way.. they described this as a "Bacon Overload".. FYI Teddy's there's no such thing. When it comes to bacon, there is no "Overload".. Only "Underload". 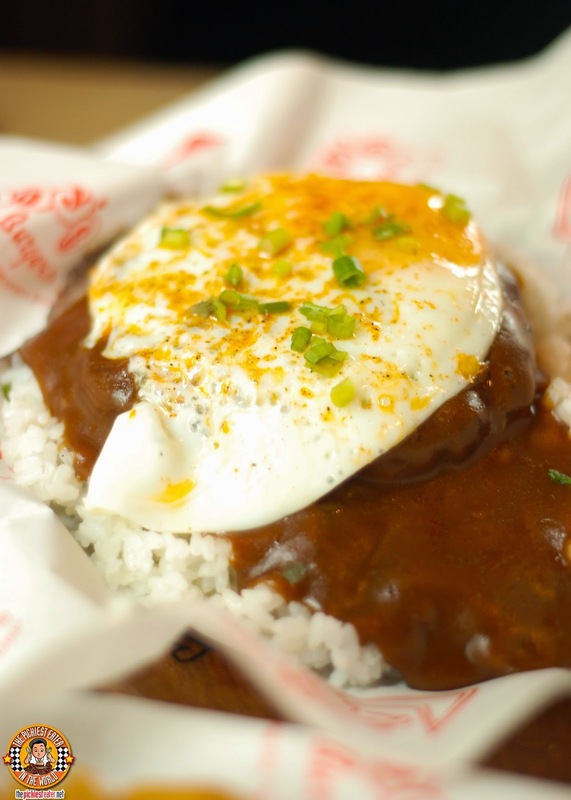 Although Teddy's is one of the few place where Rina doesn't bug me for a rice meal,seeing that they added rice meals in the form of the classic Hawaiian dish, the Loco Moco (P299). Teddy's trademark pure beef Chuck Patty, drowned in a rich, savory gravy, laying on a bed of steaming hot white rice, and topped with a perfectly cooked sunny side up egg. 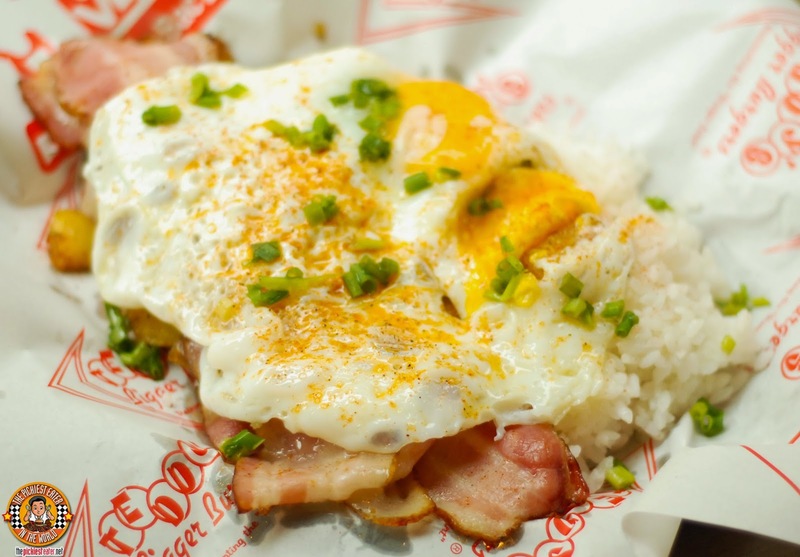 Breaking the yolk and mixing it into the gravy soaked rice creates a beautiful mess that goes perfect with the delicious meatiness of the burger patty. 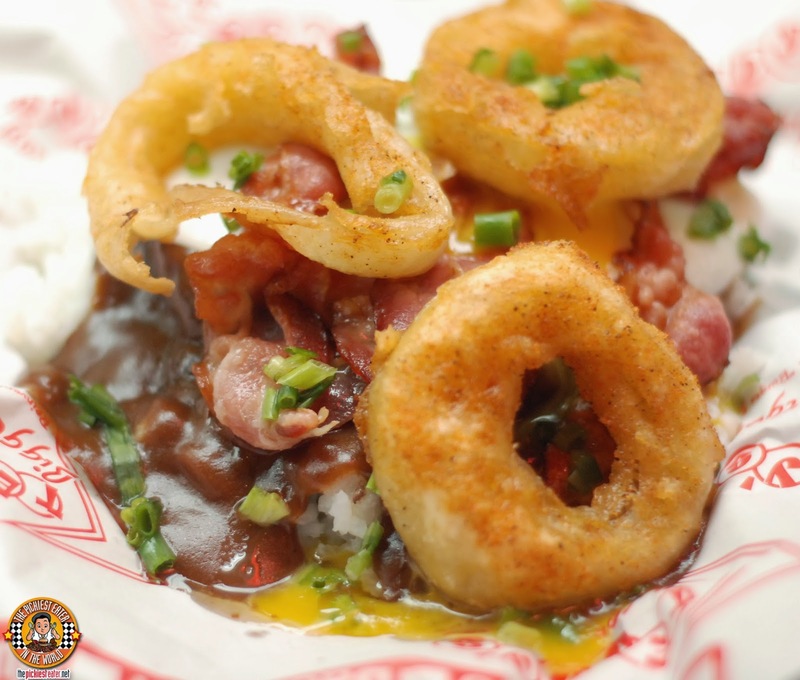 Personally though, I would go for the Western Loco Moco (P329), which adds Bacon and Fried Onion Rings to the already deliciously beefy mix! 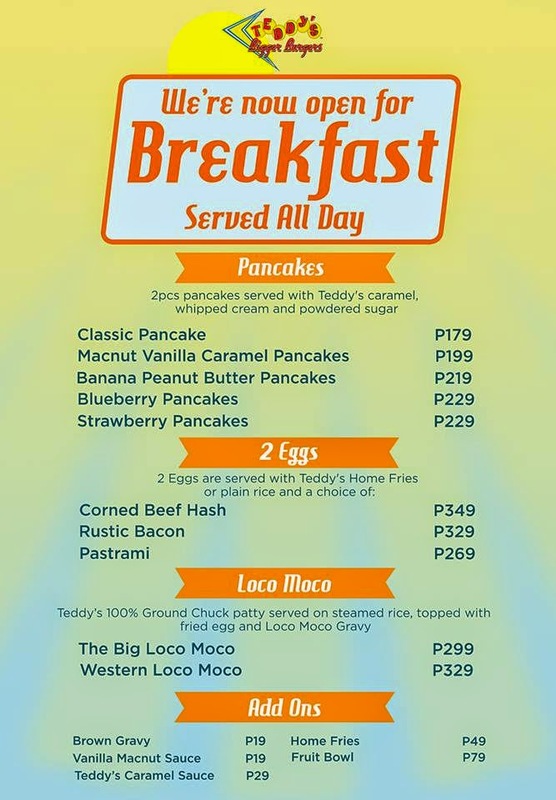 Another welcome addition to Teddy's menu is All Day breakfast items! I think it was a given that I was going to try their Rustic Bacon (P329), which was roughly three long slices of delicious smoked bacon, buried beneath two sunny side up eggs, and a bed of home fries to go with steamed rice. Ok i'm gonna flat out and say it.. Teddy's Burgers serves one of the best pancakes you'll find in the metro. It's fluffy and soft, and has the right amount of sweetness with every bite. 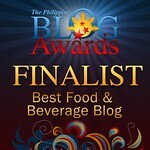 In keeping with the Hawaiian theme, I ordered the Macnut Vanilla Caramel Pancakes (P199). 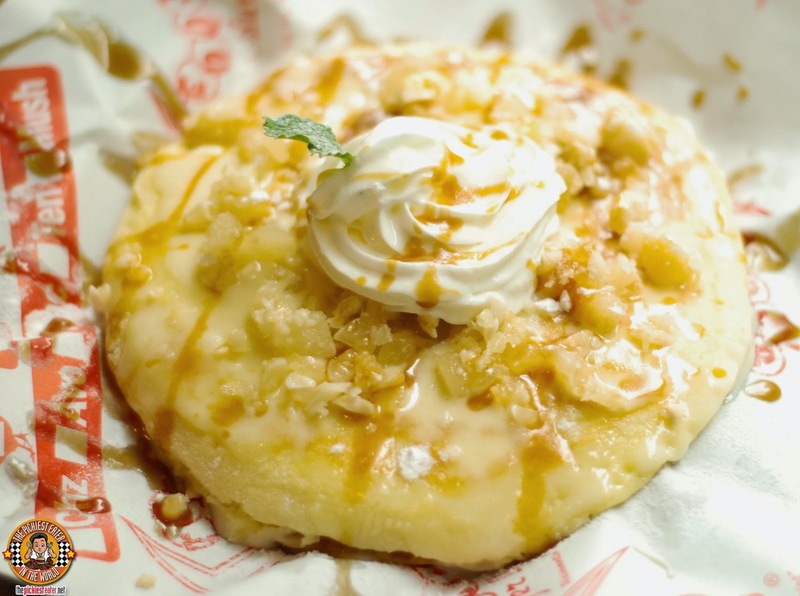 You would think the infusion of Caramel and the creamy Vanilla sauce would make the pancake too sweet, but it's balanced just right, with the nuts giving a nice crunch for added texture. Other pancake variants available are Classic, Strawberry, Banana Peanut Butter and Blueberry. 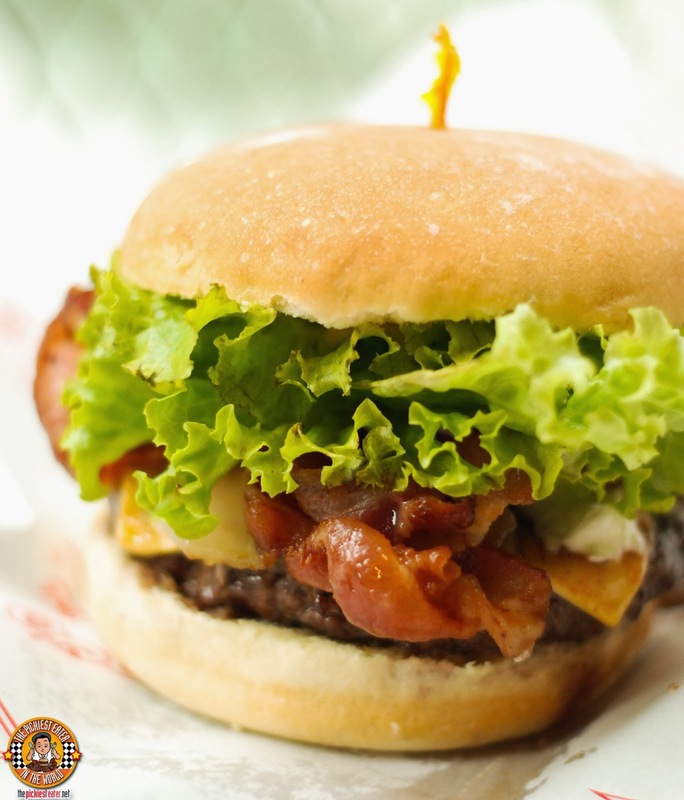 In it's short existence in the Philippines, Teddy's has definitely stamped it's claim as one of the best burger chains in the country today. With it's kitchen keeping the menu fresh and innovating to the Pinoy crowd, it's exciting to see more branches popping up very soon, including their second branch at Edsa Shangri-la Mall! Haha You and I both, Marty!! Thanks Krystle! How about the Elvis? Only available in Shang? Definitely a must try Edelweiza!